Georgia Tech's recently renovated locker rooms feature 17 large displays for IPTV and digital signage. Although the big news in college football is usually the appointment of a new head coach, a record-setting performance or new, state-of-the-art facilities, this year it has also been about million-dollar locker room renovations. The “wow” factor plays a significant role even in locker room renovations because it enhances the team’s experience and recruiting operations. From a media perspective, key drivers include IPTV and digital signage. IPTV systems provide many advantages when compared to older, RF-based TV distribution systems. Because they employ ubiquitous Cat5/6 cabling and network infrastructure, IPTV systems offer greater flexibility in the number and placement of screens than conventional RF systems that require dedicated coaxial cabling. And, because IPTV systems inherently support duplex data communication, programming options include full remote control, interactivity, and even the support of two-way video and audio communication. Even when initial build-outs do not require these features, the ability to add functions such as slo-mo video playback for coaching and random access to archival video clips, or even videoconferencing, ensure that the system is future-proofed and will be able to meet the evolving needs of the athletic program. Alpha Video Sports & Entertainment Group recently completed work on the newly renovated Yellow Jackets locker room for Georgia Tech. 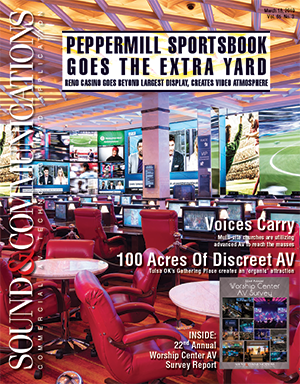 The new AV system includes 17 Sharp commercial-grade flat-panel displays of varying sizes on Chief mounts at key locations, including the entrance, aisle end-caps and hydrotherapy area. A TriplePlay IPTV system and content management system (CMS) takes a clear quadrature amplitude modulation (QAM) feed from the campus cable network and transcodes 20 channels of cable television content into IP streams for distribution on the IPTV network. A quad-channel encoder allows for four additional channels of local content to be streamed on the IPTV system. Two channels of digital signage content, as well as two streams of video-on-demand (VOD) content, are also provided. Recruitment sessions and donor-recognition events, as well as fan and family tours of the facility, all benefit from highlight content available via VOD. Sponsorship messaging and brand advertising can also be displayed as full screen or within an L-bar digital signage layout. A TriplePlay TripleChoice Education Portal allows for the control of the TriplePlay system and all IPTV set-top boxes, whereas a Crestron control processor and 10-inch touchpanel act as the user interface for control of the individual displays (power, channel, volume) and the sound system (source, volume). Content for the system includes cable television channels, locally encoded channels and digital signage channels, which primarily act as digital bulletin and message boards for the players. A local HDMI input under several of the displays also allows coaches to input a laptop or other local source directly into the display for additional content. 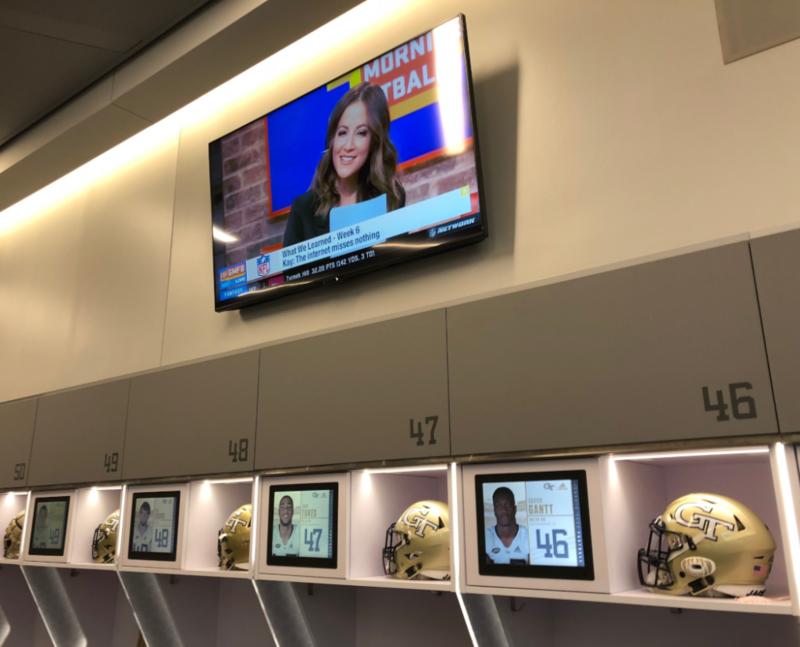 “The new AV system provides a high-tech feel and finish to the Yellow Jackets’ locker room and provides Georgia Tech with the ability to expand,” Volk said. As with most large AV systems, digital signage is a key part of the total digital media distribution system. That’s why it is necessary for the AV integration team to work collaboratively with both the IT and Security teams. As with most other digital signage projects, clear and regular communication with all stakeholders throughout the design and deployment process is key to long-term customer satisfaction. With increased television and social media exposure at all levels of collegiate and pro sports, the locker room has become even more of a focal point for fan and management attention. This, in turn, has created significant and interesting opportunities for designers and integrators with the right team spirit.